Meet Your Neighbors Online. Build Community. Participate via e-mail, the web, Facebook and Twitter. 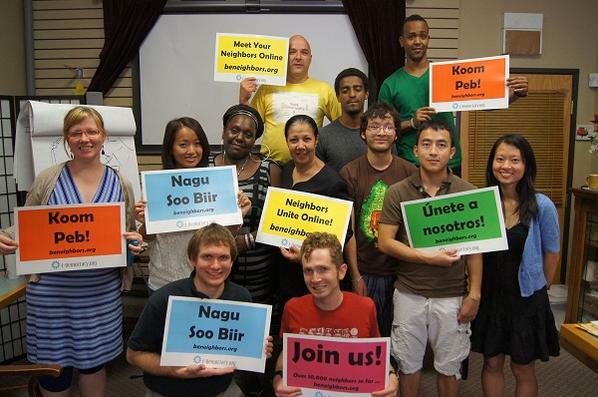 BeNeighbors.org is an E-Democracy project to create online places where neighbors meet across St. Paul and Minneapolis. Some 20,000+ area residents participate across the 35+ Neighbors Forums hosted by E-Democracy alone. In some areas, that's +30% household participation! Online connections across local communities lead to in-person community engagement "in real life." With a unified, simple, and very public shared local online communication channel that is open to all, these benefits can be unleashed. Our largest forums in Standish-Ericsson, Powderhorn, and Seward attract over 30% of households in their area with some crossing the 1,000 member mark. Building off previous inclusion efforts, in 2012 we are launching a new grant-funded inclusion campaign to grow our St. Paul forums with the greatest diversity possible to over 10,000 members in three years. Fundraising to include Minneapolis and other communities is planned. Get Started - How to participate details. Trouble joining? Contact Us for more information or e-mail your full name and desired forum to: support@e-democracy.org and we will add you manually.